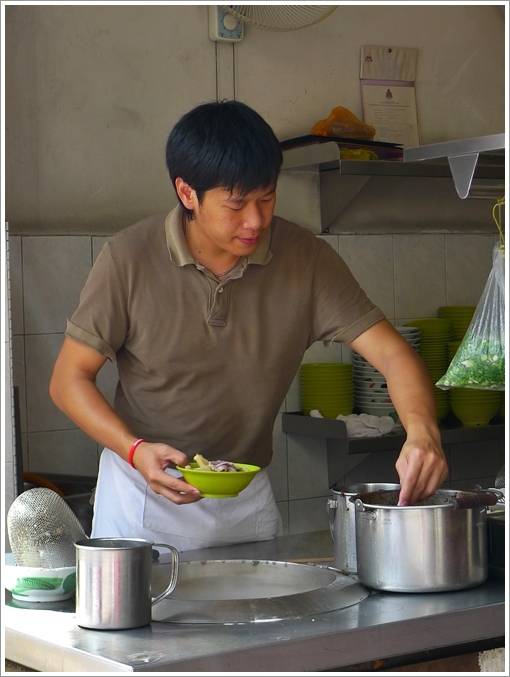 Would you have trusted this “beef noodles specialist”, if not for the positive reviews? Fond memories come flooding over me, whenever I speak about this Shin Kee next to Petaling Street. Opens only for breakfast and lunch, I used to patronize this shop (or stall?) whenever I took a bus from Ipoh to Kuala Lumpur that used to stop at Pudu bus station. So you can imagine a young guy lugging around his backpack, walking almost half a kilometres away in order to get his beef noodles fix. The shop can seat at most, about 20 patrons. Yes, less than 10 tables are set up in the small half-a-premise, hence you have to share a table with strangers if you’re alone or in two’s. No problem though, for a meal at Shin Kee is almost too clinical; you walk in, go over to the counter and place your order. Straight forward enough as you choose your noodles cooked in soup or dry, then your preferred beef cuts. Finally state whether you want to have a regular portion (RM6.00/USD1.80) or with EXTRAS at RM8.00/USD2.40 per bowl. 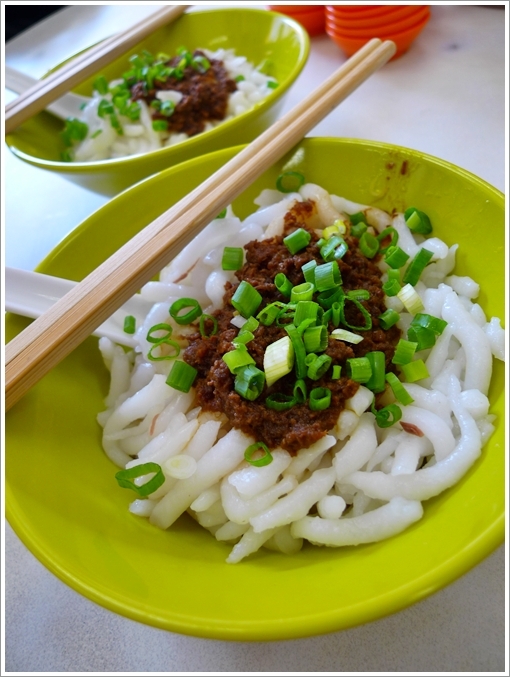 Dry Lou Shu Fun (Rat’s Tail Noodles, or Rice Noodles) with the immensely flavourful minced meat topping. Looks dry, but a spoonful or two of the wholesome beef broth and you’re good to go. Then pick your seat, and wait in anticipation for your beef noodles to come. Thankfully, the shop is air-conditioned hence providing a cool respite from the sweltering heat on the streets. You’re literally eating by the road, as from the comfort of your table, you will still be able to see curious passerby stealing a glance no thanks to the aromatic whiff, and vehicles zooming along Jalan Tun Tan Cheng Lock. 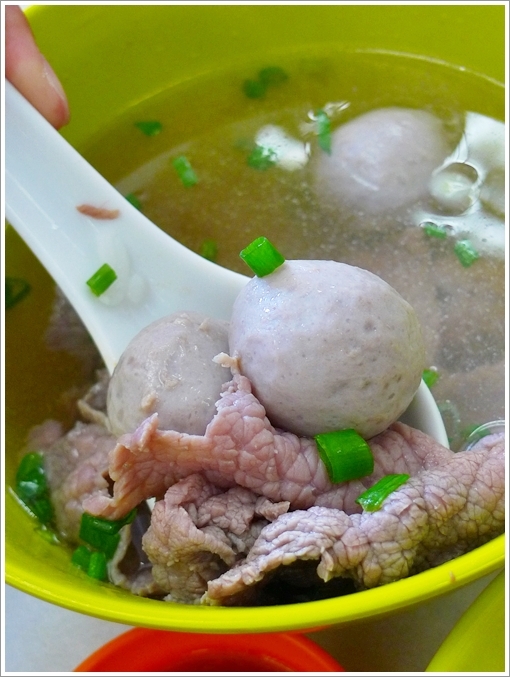 I usually settle for the tried-and-tested “Kon Low Lou Shu Fun” or dry rat’s tail noodles (short, stubby rice noodles) with a side serving of beef balls and slices of fresh beef in soup. Unlike most beef noodles outlets, you don’t get radish, or even salted vegetables in the beefy soup. Instead, only the most basic combination of chopped spring onions, and coriander as well as a dash of pepper to complement the already piping hot and flavourful broth punctuated with a robust beefy taste. Maybe you can consider adding the tripe into the ensemble, but I stick to the bouncy balls and tender slices of beef for the best experience. Business hours : 10.30am – 3.30pm daily. Here’s a GOOGLE MAP to Shin Kee Beef Noodles Specialist. So good that the store can continue on from one generation to another……..
Hmmm… with the specialist suffix to the name, it’s kind of intriguing as to what one will discover in the taste. Despite not yet trying this place, im raring to have a go! Please do, for the cramped space and sitting on stools will remind one of dining in Hong Kong’s char chan teng. woo.. I’ve passed by this place a couple of times.. just didn’t stop by to have a bowl.. I heard its good.. 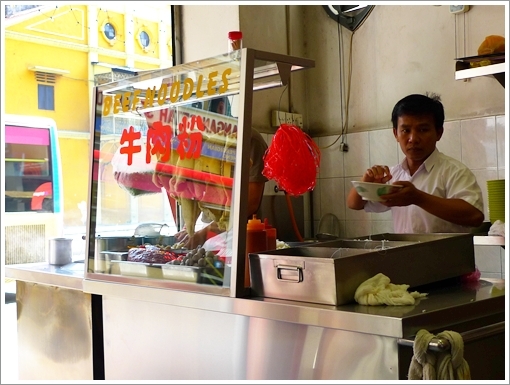 Try it, the portion ain’t too hearty, which is good since you can do a food hunt around Petaling Street area …. Eh the auntie was just there 2 weeks back. She went to the other stall now?!?!?! Not sure, Kelvin, but from Serene’s comment, it seems that the son handles the day session, while the parents run the night stall. //Btw, great photos and write up James! Thanks Serene, I could have guessed that he’s the new generation of Shin Kee. No memories of him being there the last few years though. I think I know where this place is. Usually would pass by the shop when I’m taking nite bus from KL back to Ipoh but they’re close at nite. Not sure about their new operating hours now. Closed at night also, I think. I usually had my lunch there only. A nightmare if you’re driving, but when I took the bus from Ipoh-KL, never failed to have a bowl of beefy goodness here, or at Lai Foong opposite the road. Haha, somewhat. But it’s like eating by the streets, but with air-conditioning. Not bad, and I had no bad memories of getting stomach ache or whatnot after eating here. at night they’re operating right in the heart of chinatown, at the start of the backlane of Hong Leong Bank. Eaten this before a few times,. Tried both the soupy as well as dry versions. IMHO, The dry version is better. Good stuff! For me, dry version of noodles is always nicer. Unless it’s pork noodles. The slurry of minced meat at Shin Kee is intense, very beefy and coat the noodles well. being a beef ball noodle person, i still haven’t tried this place even though i’ve heard of it. i stand by Jalan Silang’s version though. the texture of the egg noodles at Yang Kee, for example, doesn’t hold a candle to Soong Kee’s. Didn’t find Ngau Kee (Tung Shin) particularly memorable either. I see … yeah, the dry beef noodles from Shin Kee tops all, even Soong Kee in my opinion. Seriously? maybe they just went back to operate from the stall further down the roads at night. I have tried Shin Kee, but nothing can compared to the PUCHONG KB Beef Noodles. Because I am from KELANTAN and I stayed in PUCHONG. 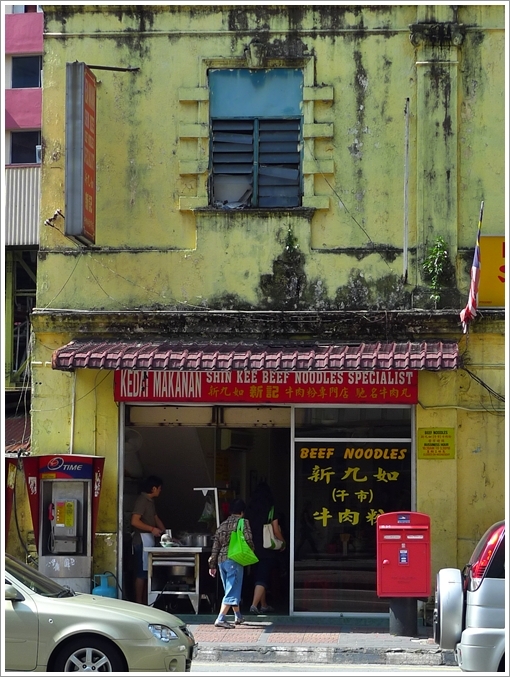 I have recently discovered and would like to share GOOD FOOD -the famous Kota Bharu, Kelantan Beef Noodles (Lim Siong Kee – about 36 years history) has travelled to PUCHONG (I have waited for more than 30 years for its arrival). Located at Restoran KH20 – 67, Jalan Kenari 20, Bdr. Puchong Jaya (opposite IOI Mall). Open daily from morning to lunch & closed on Sundays. I have taken it many times and I love it (no need to go back to KBharu yearly ). You should go and try it.